An expression of femininity for the real woman splashed down Dan Liu’s New York Fashion Week runway in pale pink lace and pops of pastel graphic prints. 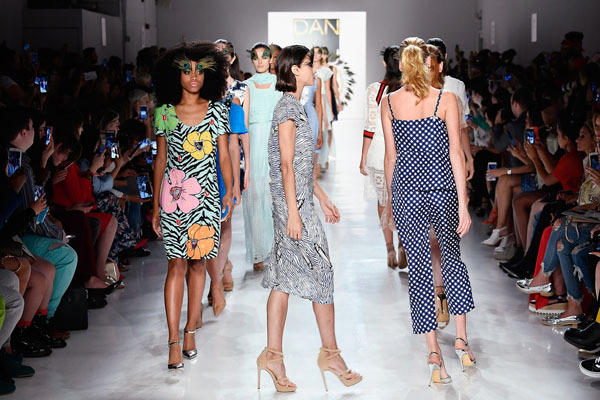 Always a fashion week favorite, Dan Liu’s venue was packed to capacity with several industry members watching from the television screens out front. Pale pinks transitioned into fresh whites, then cascaded to muted neutrals of tan with delicate gold details and textures. Spring summer 2018 arrived with floral prints that almost allowed guests to smell the lavender at tea time in the park. Dan showed off his beautiful graphic work with teal cheetah print, vibrant coral zebra, and subtle peacock. The vibrancy continued with a wide strapped cold shoulder crystal accented dress that sparked like the sea. The deep blue and sea foam green toned dresses and separates that followed spoke the sounds of the lonely beach that not only is the theme of the collection but the soundtrack to the show. “Smell the Sea, Feel the Breeze, Hear the Ocean, Be at Ease” was the true inspiration of this gorgeous collection of cocktail attire. A standout white frayed ruffle dress mimicked that of a bird fluttering in the wind—a compliment to the peacock inspired make up. Subtle frill and crystal accents showed Dan Liu’s attention to detail and talent. The finale look, in all white, was adorned by a peacock hoop that transformed her into a colorful angel with wings. While these incredible looks strutted down the catwalk, the gentle finale melody played in Japanese, one of Dan’s many languages. Notable attendees included Annie Q of HBO The Leftovers, Miss Universe Iris Mittenaere, Miss Teen USA Sophia Dominguez-Heithoff, and Real Housewife Stephanie Hollman all dressed in Dan Liu along with Francesca Curran of OITNB, actress India de Beaufort, and Sarah Mack from VH1’s Daytime Divas.